They say a climate downturn may have caused a drought, placing pressure on the last surviving Neanderthals by reducing their supplies of fresh water and killing off the animals they hunted. Sediment cores drilled from the sea bed near the Balearic Islands show the average sea-surface temperature plunged to 8C (46F). Modern-day sea surface temperatures in the same region vary from 14C (57F) to 20C (68F). In addition, increased amounts of sand were deposited in the sea and the amount of river water running into the sea also plummeted. Neanderthals appear in the fossil record about 350,000 years ago and, at their peak, these squat, physically powerful hunters dominated a wide range, spanning Britain and Iberia in the west to Israel in the south and Uzbekistan in the east. Our own species, Homo sapiens, evolved in Africa, and displaced the Neanderthals after entering Europe about 40,000 years ago. During the last Ice Age, the Iberian Peninsula was a refuge where Neanderthals lived on for several thousand years after they had died out elsewhere in Europe. These creatures (Homo neanderthalensis) had survived in local pockets during previous Ice Ages, bouncing back when conditions improved. But the last one appears to have been characterised by several rapid and severe changes in climate which hit a peak 30,000 years ago. Southern Iberia appears to have been sheltered from the worst of these. But about 24,000 years ago, conditions did deteriorate there. 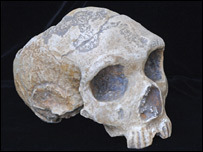 This event was the most severe the region had seen for 250,000 years, report Clive Finlayson, from the Gibraltar Museum; Francisco Jimenez-Espejo, from the University of Granada, Spain; and colleagues. Their findings are published in the journal Quaternary Science Reviews. "It looks pretty severe and also quite short," Professor Finlayson told BBC News. "Things like olive trees and oak trees that are still with us today managed to ride it out. But a very fragmented, stressed population of Neanderthals - and perhaps other elements of the fauna - did not." The cause of this chill may have been cyclical changes in the Earth's position relative to the Sun - so-called Milankovitch cycles. But a rare combination of freezing polar air blowing down the Rhone valley and Saharan air blowing north seems to have helped cool this part of the Mediterranean Sea, contributing to the severe conditions. Gorham's Cave on Gibraltar shows evidence of occupation by groups of Neanderthals until 24,000 years ago. But thereafter, researchers have found no signs of their presence. However, in an interesting new development, scientists are also now reporting another site, from south-east Spain, which has yielded evidence for the late survival of Neanderthals. In a study published in the journal Geobios, Jose Carrion, Santiago Fernandez Jimenez, from the University of Murcia; and colleagues analysed pollen from soil layers at Carihuela cave to determine how vegetation had changed in the area during the past 15,000 years. They also obtained ages for sediment samples from the cave, using radiocarbon dating and uranium-thorium dating. Sediment layers containing Neanderthal tools were found to date from 45,000 years ago until 21,000 years ago. These radiocarbon dates are "raw", and do not exactly correspond to calendar dates. They cannot therefore be compared directly with those from Gibraltar, which are calibrated. Spanish archaeologists carried out a detailed excavation of Carihuela between 1979 and 1992. 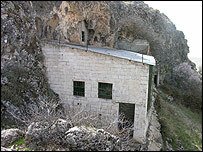 But the cave is currently closed due to a dispute between national and regional governments over rights to dig there. Neanderthal bones have also been excavated from these sediment units, including a male skull fragment which could potentially be very recent. But Professor Carrion is reluctant to draw conclusions. "The human bones have been recovered in different excavation campaigns over 50 years. The relationship between them and the dates I provide must be treated with caution," Professor Carrion told BBC News. He added that sediments in parts of the cave could have been churned up, mixing old bones in with younger material. Clive Finlayson suggested the late Neanderthal dates from Carihuela might agree well with those from Gibraltar once they were calibrated.